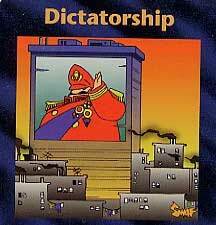 Before we get into this horrific Executive Order which President Bush issued last week, let us review the type of absolute dictatorship which the Illuminati has planned for us. You might be shocked, because a document known as "The Protocols of the Learned Elders of Zion", details exactly the steps which President Bush is taking America, right here and right now. (NOTE: A former Satanist told me that the Protocols was probably written via Automatic Writing in the late 1800's; Dr. Makow states that The Protocols was written by Lionel Rothschild -- 1868 - 1937. The Protocols are being enacted by our leaders today! Make no mistake about where this "War on Terrorism" is leading us -- straight into Totalitarianism! "Those who would give up liberties in order to achieve safety deserve neither liberty nor safety". Bush is already following the Plan of The Protocols by saying that "many people in the United States may, at least temporarily, lose some of their freedom and privacy rights"! Mr. Rosenberg is right on target when he states that President Bush was deliberately signaling his allegiance to the Illuminist document known as The Protocols of the Learned Elders of Zion. Now, let us turn to the Executive Order which President Bush signed last week. The Executive Order titled ' Blocking Property of Certain Persons Who Threaten Stabilization Efforts in Iraq ' was signed last week on the 17th of July and acts as an amendment to the National Emergencies Act. "GEORGE W. BUSH, President of the United States of America, find that, due to the unusual and extraordinary threat to the national security and foreign policy of the United States posed by acts of violence threatening the peace and stability of Iraq and undermining efforts to promote economic reconstruction and political reform in Iraq and to provide humanitarian assistance to the Iraqi people, it is in the interests of the United States to take additional steps with respect to the national emergency ... I hereby order: "
NOTE: At this point, we shall only address those portions which threaten individual patriots. (B) undermining efforts to promote economic reconstruction and political reform in Iraq or to provide humanitarian assistance to the Iraqi people;"
While no law-abiding patriot would commit "acts of violence", the simple word "act" is vague enough to drive a Mack truck through! Is Cutting Edge liable because we post Daily News Updates which faithfully report the true news from Iraq? I would estimate that this word could easily be stretched to include this ministry. "(ii) to have materially assisted, sponsored, or provided financial, material, logistical, or technical support for, or goods or services in support of, such an act or acts of violence or any person whose property and interests in property are blocked pursuant to this order..."
The word, "services" is another extremely vague word which can be made to mean anything the White House wants it to mean. Later, this Executive Order lists "conspiracy" as one of the prohibited categories, a term which literally means anything the Federal Government wants it to mean. Listen to the insight from this article, below. "President Bush's newest executive order states that any American citizen who threatens the peace and stability of Iraq and undermines efforts to promote reconstruction and reform there may have all their property and interests seized by the Treasury department without warning. The hypocrisy on display here is astounding given that the only persons in America who are doing these things are the ones who invaded Iraq in the first place and continue to sow chaos and destruction in the face of all time high public opposition." This viewpoint is totally correct! Iraq is in a state of civil war and unrest only because President Bush launched an unwarranted unprovoked attack on this sovereign nation. To add insult to injury, Bush justified his planned invasion on the basis of a pack of lies, which now almost everyone in the world understand. Yet, this president is planning on using opposition to the Iraq War as a justification to start seizing the private property of people opposed to this war, and eventually put in prison, anyone who is opposed to this illegal and immoral war! This next article speaks to another angle of this horrific lurch toward an Absolute Dictatorship. "I have issued an Executive Order blocking property of persons determined to have committed, or to pose a significant risk of committing, an act or acts of violence that have the purpose or effect of threatening the peace or stability of Iraq or the Government of Iraq or undermining efforts to promote economic reconstruction and political reform in Iraq or to provide humanitarian assistance to the Iraqi people." "In substance, under this executive order, opposing the war becomes an illegal act." When the Illuminati decides to stage the next 9/11 type terror attack, the government is going to arrest all kinds of dissidents on all different charges, from opposing the war in Iraq to being a tithing Christian! Has Bush signaled us that this terrible time is close at hand? With world events coming to a climax, including the wars in the Middle East, is it possible for the domestic terror to fall? If this is the case, then the next article will make a lot of sense. "President Bush's post-terror attack martial law plan is so shocking that even sitting members of Congress and Homeland Security officials are barred from viewing it, another example of executive über alles and a chilling portent of what is to come as constant reminders of the inevitability of terror attacks reverberate. Congressman Peter DeFazio (D - OR) was asked by his constituents to see what was contained within the classified portion of the White House's plan for operating the government after a terrorist attack." "Since DeFazio also sits on the Homeland Security Committee and has clearance to view classified material, the request would have appeared to be routine, but the Congressman was unceremoniously denied all access to view the documents, and the White House wouldn't even give an excuse as to why he was barred. " Not surprisingly, the Oregon Congressman was at a loss to answer the question as to why a Congressman, with the necessary security clearances, and with a "need to know", is denied the opportunity to read what the Federal Government is planning to do to its citizenry.
" 'I just can't believe they're going to deny a member of Congress the right of reviewing how they plan to conduct the government of the United States after a significant terrorist attack', DeFazio told the Oregonian on Friday. 'We're talking about the continuity of the government of the United States of America," DeFazio says. 'I would think that would be relevant to any member of Congress, let alone a member of the Homeland Security Committee'." No, the Congressman does not really understand. The real reason he was disallowed in his plan to read the document is because it has less to do with the continuity of the government following the next terror attack and more to do with the bold plan to dissolve the Constitution, to take away citizen's liberties and to clamp down with the ruthlessness described above in "The Protocols of the Learned Elders of Zion"! Let us go back to this featured article to see some of the provisions which are known to exist. "What we already about Bush's recent spate of executive orders, and in particular PDD 51 , is bad enough - the provisions outline preparations for the implementation of open martial law in the event of a declared national emergency. New legislation signed on May 9, 2007 , declares that in the event of a "catastrophic event", the President can take total control over the government and the country, bypassing all other levels of government at the state, federal, local, territorial and tribal levels, and thus ensuring total unprecedented dictatorial power. " "It is important to understand that, although these powers have been on the books for previous presidents, Bush is the first to openly brag of the fact that he will utilize them and officially become the supreme emperor of the United States in the aftermath of a catastrophe that the government itself has said will happen on innumerable occasions." "According to columnist and author Jerome Corsi , the power grab assures that "The president can declare to the office of the presidency powers usually assumed by dictators to direct any and all government and business activities until the emergency is declared over." If you want to know how long it will be for the "emergency to be declared over", refer to the Protocols above: " It is not worthwhile to say anything about how long a time they will be kept waiting for this return of their liberties ." 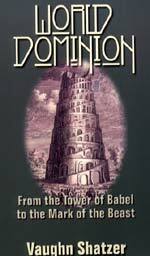 "Also in May, it was reported that a high-level group of government and military officials has been quietly preparing an emergency survival program named 'The Day After: "Annihilation from Within," , which would effectively end civil liberties and implement a system of martial law in the event of a catastrophic attack on a U.S. city." NEWS1551 - Posted Early October, 2001 - "BITTER FRUITS OF BUSH'S WAR ON TERRORISM -- PROPOSED LOSS OF PERSONAL AND CONSTITUTIONAL FREEDOMS" -- "Predictably, Bush Administration experts are proposing new laws and police regulatory rules in the guise of fighting terrorism that just might take away too many of our precious liberties -- Just as the Protocols of the Learned Elders of Zion envisioned!" NEWS1553 -- Posted Early October, 2001 - "BUSH ADMINISTRATION IS ALREADY REDEFINING TERRORIST!" - We predicted a week ago that the major danger posed by all these new broad "Antiterrorism" powers the government was seeking was that, after the powers have been granted, the government may simply redefine who a terrorist is and what constitutes terror. That redefinition began yesterday [10/3/01] by Governor Tom Ridge of Homeland Security! Christians who write the plain truth may suddenly be pursued as terrorists!" NEWS1558 - Posted Mid-October, 2001 -- "BREAKING OUT OF THE MENTAL BOX -- LEARNING TO THINK IN THE OPPOSITE DIRECTION OF PROPAGANDA TO FIND THE TRUTH "
NOTE: This article proved to be one of the most important Cutting Edge has ever posted. Its principles are timeless. If people can even hope to understand the events of the world, they must understand that the truth is most often found in the exact opposite direction of the Public Rhetoric. NEWS1567 - Posted Late October, 2001 -- "ANTI-TERROR LEGISLATION -- RUSH TOWARD DICTATORSHIP"
NEWS1571 -- Posted Late October, 2001 -- "PROPAGANDA PRINCIPLE: FEAR OF CONFLICT IS NEARLY AS EFFECTIVE IN PRODUCING DESIRED CHANGE AS ACTUAL CONFLICT!" - The changes in society, values, and attitudes for which the Illuminati is seeking is served very well by threat of attack, almost as well as actual attack. World is now in the prophetic time period, "Wars and Rumors of Wars ". 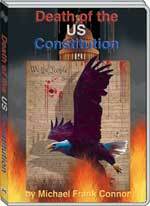 NEWS1575 - Posted Late October, 2001 -- "RUSH TOWARD DICTATORSHIP! BUSH ADMINISTRATION TO USE CIVIL WAR ERA "SEDITIOUS LAW" THAT JAILS PEOPLE WHO JUST CRITICIZE GOVERNMENT; ALSO, FBI NOW LISTENING TO CONVERSATIONS BETWEEN LAWYER AND ACCUSED"
NEWS1576 -- Posted Late October, 2001 -- "RHETORIC AND REALITY: COMPOSITE PICTURE OF THE RAPIDLY APPROACHING DICTATORSHIP!" NEWS1577 -- Posted Early November, 2001 -- "MARTIAL LAW - PART 1 -- IN THE CITIES"
NEWS1579 - Posted Early November, 2001 -- "ASHCROFT'S FBI TIGHTENING NOOSE AROUND 'DOMESTIC TERRORISTS' "
NEWS1580 - Posted Mid-November, 2001 -- "'DOMESTIC TERRORIST' REPORTED IN CLINTON-ERA F.B.I. FLYER HAS NOW BEEN CODIFIED INTO LAW! PATRIOT ACT WILL BE OUR UNDOING"
NEWS1584 --Posted Late November, 2001 -- "AMERICA'S 'MOST TRUSTED' PRESIDENT HAS ALSO GRABBED DICTATORIAL POWERS! Historic truth is that governments eventually use all the power over their citizens that they have succeeded in accumulating. This fact makes this dictatorial power of President Bush all the more nightmarish." 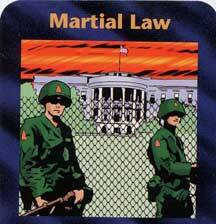 NEWS1597 -- Posted Late December, 2001 -- "NATIONAL POLICE FORCE COMING TOGETHER: ANOTHER PARALLEL TO ADOLF HITLER"
As you can see, Cutting Edge has known the plan for Martial Law and a severe Dictatorship for a very long time, in the early 1990's, to be exact. Events unfolded after 9/11 almost precisely as we envisioned they would. Consequently, we were the first to start raising the "Red Flag", warning Americans that the end result of this terrible staged terrorist attack would be Martial Law and a Dictatorship unparalleled in world history. The genius of this entire effort to subvert our Constitutional government, taking away "life, liberty and the pursuit of happiness" from individual American citizens is that the laws have been passed, but have not been enforced yet. When will they be enforced? The exact timing is not yet apparent, but these Bush Executive Orders seem to indicate that the moment to suddenly enforce them all is close at hand. This next statement is worth of framing, as at least one Congressman now fully understands.
" 'Maybe the people who think there's a conspiracy out there are right', DeFazio concluded." Yes, indeed, the Executive Order which President Bush signed is a direct result of the Illuminati conspiracy going back well over 100 years! To "The Protocols". 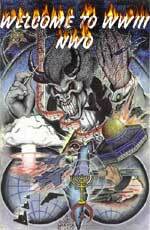 Soon, this Bible prophecy will be implemented, not long after the "Masonic Christ" has arisen out of the ashes of a Third World War, coming to a globe which has been stripped of all governments of limited powers and freedoms for the individual citizen.